There are hundreds of products on the market that are designed to help scrapbookers store and organize their supplies and equipment. In addition to the commercially-produced storage solutions, there are lots of fun do-it-yourself storage ideas to bring order to the chaos. With all the scrapbook storage systems on the market there's sure to be a set-up that's perfect for you. No matter which system you choose, keep like items together and label everything. When selecting storage products choose colors and styles you love. Scrappers who share their workspace with other family members or simply hate the look of any unnecessary clutter may find that closed storage is a good fit for their needs. 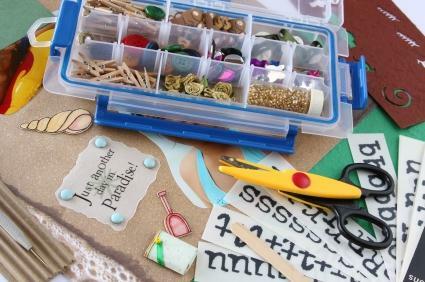 Most craft stores sell square cardboard boxes for storing 12x12-inch scrapbook paper, tools, and containers of scrapbook embellishments. You can give these boxes personal flair by covering them in scraps of paper. Add a label that makes it easy to determine the contents of the box. If you don't want to take the time to decoupage the boxes, you can buy decorated archival storage boxes from Jo-Ann Fabric and Crafts. If you're a mother with young children or a proud pet owner, you need to look for storage items that will keep dangerous objects safely out of reach. Scrapbook supplies are pretty and colorful, which makes them hard to resist! You don't want to find that your child has mistaken a jar of buttons for candy or that your precious kitty has become hopelessly tangled in a basket of ribbons. High shelves and containers with locks or latches are the most safety-conscious storage choices. One really creative way to store scrapbooking supplies safely out of the way is to repurpose containers originally intended for something else. If you have an open wall in your crafting area, attach some of the following containers for unique scrapbook storage. Give everything a coat of spray paint in your favorite color for a cohesive look. Use a wall-mounted metal mailbox to store stickers and paper scraps. Install hooks and metal buckets to hold small tools like paper punches, scissors, and acid-free pens. Use a vertical magazine rack to store your favorite papers and stencils. Try two shelf brackets and a dowel to support spools of scrapbooking ribbon. If you tend to forget what supplies you have once they're put away, an open storage solution using magnets is probably the best option. Attach a piece of framed sheet metal or a magnetic board to your wall, and pick up some round magnets at your local craft store. Use a hot glue gun to attach a magnet to the back of each rubber stamp, paper punch, or other tool. You can even attach strong magnets to the side of a container and use that to corral your scissors and pens. 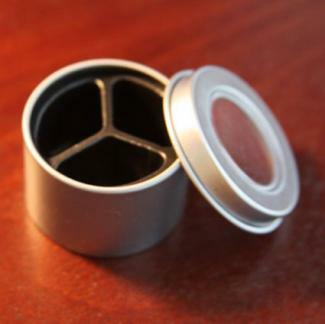 If you need magnetic storage tins, Go-Organize has small round tins with divided compartments sold in sets of three. A three-ring binder is a great way to organize scraps of paper, stickers, stencils, and other embellishments. Use your scrapbooking skills to create a fun cover for the binder, and then sort the smaller items into clear plastic compartments that will go inside. Use tabs to help you find what you're looking for quickly. Make the tabs from scraps of ribbon for a pretty decorative touch. Look for 3-inch extra large binders at Office Max. You can buy pre-made scrapbooking carts, but making one will let you customize it to your needs. Start with a plastic rolling cart from an office supply store, and then use glue to attach the items and decorations you'll need. Start by attaching a paper cutter to the top of the cart. Add decorative knobs for opening the drawers. Line each drawer with pretty paper, add dividers to help you keep track of odds and ends, and label everything so you can easily locate your supplies when you're ready to scrapbook. For the best results, choose a large cart with easy-to-move wheels that will fit the standard 12x12-inch scrapbook paper. 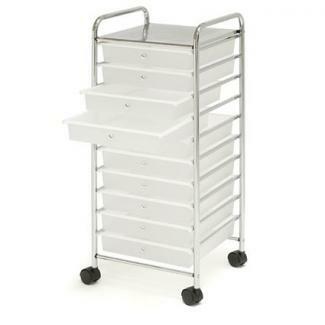 The Seville Classics 10-drawer organizer on the Walmart website is a great example of a cart suitable for scrapbook storage. 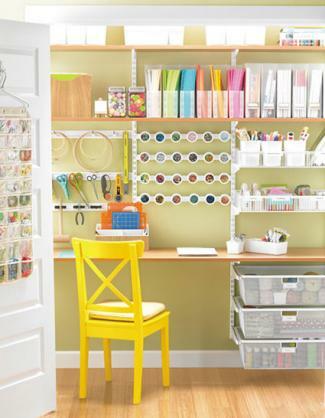 If you have the space, a desk dedicated to scrapbooking can be a wonderful way to keep your supplies organized. An Elfa desk and storage system from The Container Store has open shelves for holding supplies. An EZ View Desk 2.0 from Scrapbox has compartments built into the desk to hold paper and embellishments. If you frequently add crops or attend scrapbooking classes, a tote is a handy way to keep frequently used supplies together. Crop in Style rolling totes are the most popular option. They are similar in appearance to a wheeled suitcase, but have compartments inside to help keep paper, scissors, stickers, and other items in order. Before you rush out to invest in expensive scrapbook totes or paper holders, spend an afternoon going through your supply stash to see exactly what you have. If you tend to be an impulsive shopper, you may discover several items you completely forgot that you owned! Once you know what supplies you have, it will be easier to come up with a suitable way to keep them all in order. Once you have your supplies organized don't forget to go through them on a regular basis to get rid of anything that is unnecessary. Many scrapbookers find that their style evolves after they've been making layouts for a year or two. Perhaps you favored cute and contemporary embellishments when you started scrapbooking, but now your style is much more elegant and traditional. Feel free to pass along supplies that no longer seem suitable to someone who is just getting started scrapbooking. If you can't find a friend who wants the items, keep in mind that donations of cardstock, stickers, and other supplies are often welcomed by schools, daycare centers, and women's shelters. You'll be doing a good deed by donating unwanted items and it's easier to create beautiful scrapbooking layouts for your own albums when you know exactly where to find all your favorite tools and supplies.